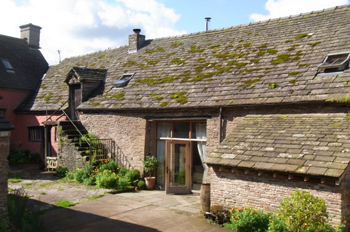 Dukes Farm’s holiday homes lie at the heart of the family farm in the upper Monnow valley, facing south­west to the Black Mountains, just outside the Brecon Beacons National Park. 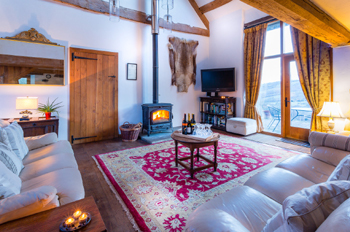 They provide luxury self-catering accommodation all year round in a scenic mountain setting for a short break, family holiday or house party. 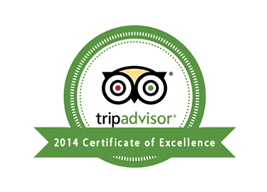 Their spectacular location and high standards make them the perfect choice all year round. Set in their own pasture land where guests can walk ‘free-range’ – a great environment for pets & children. All welcome. 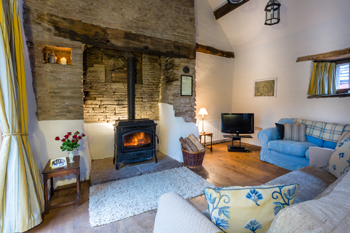 Swallow Barn was an old threshing barn, now converted to a smart four-bedroomed property with luxurious living and dining facilities for up to 16 people. Its stunning circular light fitting and vaulted ceiling provide ample bright space for expansive parties, supported by excellent kitchen equipment and tableware. 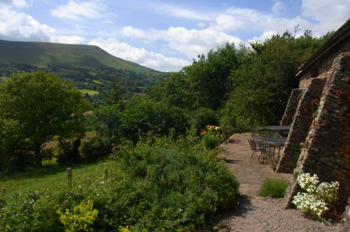 The lounge has spectacular uninterrupted views of the Black Mountains, and opens on to a vineyard and south-facing terrace with plenty of high quality seating. 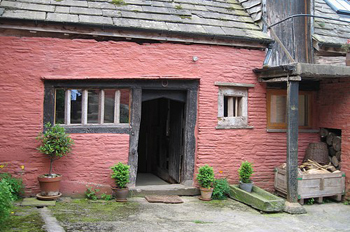 The Granary is a snug old dwelling that oozes character. 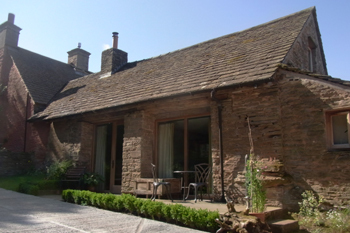 The door opens onto flagstone floors, ancient oak studding, and heavily beamed bedrooms. The high living space above with its original plasterwork is overarched by huge oak timbers. The whole is imaginatively endowed with natural textures and comfortable furnishings, featuring an iconic Heal's Spider table. The stone buttresses on its south-facing terrace hold the sun’s warmth, an ideal spot for admiring the vineyard and mountain beyond. 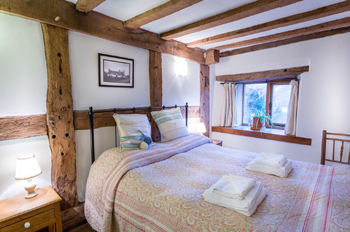 Goose Cotts is an ancient cruck house converted to a studio flat with a romantic canopied bed on a balconied mezzanine. The mullioned windows, massive blacksmith’s hearth and large glazed frontage make a rich marriage of ancient and modern. Outside is an east-facing breakfast patio, and southerly terrace for afternoon sun. A famous local dowser divined seven streams running beneath – it has a very special feel. Sofa bed for extras. There is wi-fi throughout the properties, large digital TVs, Mp3 docks, DVD and CD players. The kitchens are well-equipped with matching tableware and glassware. There are quality appliances in each property: a stove, hob, dishwasher, washing machine, fridge freezer, microwave, blender, and excellent cooking equipment. All showers cabins are 1200mm, and the double beds are generous king size, with pure cotton bedding and deep down duvets (synthetic available on request). Unlimited good dry logs for the large woodstoves are included in prices. The properties' Grade II listed authenticity has been preserved with walls colonised by ferns and flowers, stone-tiled roofs and original oak timbers retained. The interiors are stylish with light, open spaces blending with planked English oak fittings and country antiques. The properties are generously supplied. 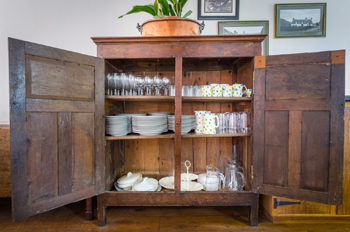 The kitchens contain beverages, condiments, oils, kitchen linen and cleaning materials. The bathrooms are stocked with bath sheets, hand towels, loo rolls and toiletries. 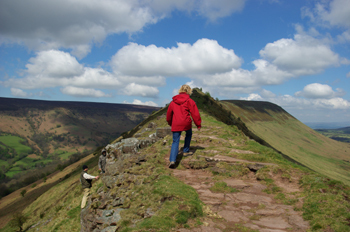 The Black Mountains provide magnificent views and a unique and bloody past recorded in the castles, churches & houses of the area. Our Historie of Cressewelle, details these local places and events over the centuries, and the properties have maps and tourist guides for walking, cycling, canoeing, pony trekking and sightseeing round the characterful Welsh borders near Hereford, Hay-on-	Wye, and Abergavenny. Dukes Farm makes an excellent starting point for tours: the Black & White Village Trail, the Cider Route, & the Holy Valley. The region abounds in freehouse pubs, castle ruins, and spectacular walks, long and short.